Amy from Nearly Everything but the Kitchen Sink sent me the most amazing post, 2000 words, and it was wonderful. I have asked her to abridge it and publish the full version on her own blog at a later date. Truly amazing story. I was 23 and had recently graduated. Life was busy. The only hitch was the consistent bleeding I was experiencing. “Stress,” my GP repeated airily. But I wasn’t stressed I thought uneasily. I awoke with a dull ache I couldn’t put my finger on and uncomfortable cramping.. “Oh you too?” my colleague said sympathetically. “There’s been a tummy bug going round the building like that.”. By the afternoon I was being sick and struggling to maintain any composure at all. Gratefully, I collapsed in bed with a hot water bottle and paracetomal which barely touched the sides of my malaise. I heard my housemate come and go again. Suddenly a strange feeling and new urge washed over me. I ran to the bathroom and discovered to my horror that something else entirely was going on and there, as I meet the most miniature foot I could imagine. The world clicked into slow motion and me as I knew myself drifted above seemingly to watch over the proceedings in abject horror and disbelief. Far below me, a young girl still in her work clothes was there all alone, with a breeze lightly whistling through the open window, delivering a breech premature baby. I was a shell going through actions I could not comprehend, things I knew nothing about automatically like a robot. A tiny cry pierced the room. Time stood still. The girl grabbed a towel, off the radiator and wrapped it clumsily around the baby. The noise had stopped and the umbilical cord now felt slimy and cold. Seconds ticked by. Hello, you’re through to emergency services. Which service do you require…? Brash sirens ripped through the eerie quiet and a loud bang indicated the paramedics had broken in. I stood there numb; they took the infant and left as quickly as they arrived. I had no idea if she was alive or had passed away. NICU is like a horrific game of snakes and ladders but with your own children. But for me, the hardest thing was coming to terms with the fact that literally in an instant I had gained a child. She might have been born just before 28 weeks, but I had not even had 28 minutes to come to terms with expecting a baby. My overpowering emotion throughout the stay was one of intense shame and guilt. 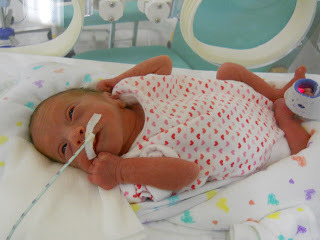 I think all, or most preemie parents or indeed any who have had a child on SCBU can identify with some level of guilt. My own personal conflict was that the one womanly job I was biologically designed for I had screwed up. I couldn’t even register I was carrying a child, far less that the pregnancy was running into serious problems eventually culminating preterm labour. The lack of time for bonding, whether with a bump, a splodge on a scan photograph or being able to moon over nursery essentials in preparation hit me hard. I was so desperate to love and protect this tiny being in an incubator, but my brain could just not compute that she was mine. How would I ever be worthy enough of this beautiful wriggly little girl? Slowly I became more confident. When I held her, it felt like part of me was complete. As much as a parent is the epitome of safety for their children, in the early days Wriggles also became that rock for me. She brought me back from the brink when no one else could. I remember a friend remarking once when she came to visit with me, that I looked like I had “come alive” when with her. To this day, I consider that one of the best compliments. For so long, I felt I was pretending at being a mum that for someone else to recognise my love and devotion was like a weight off my shoulders. 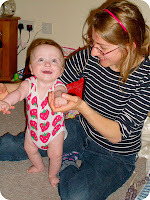 Although I am proud and firm in being the only mama available for Wriggles, I still balk at the beginning we had. It is something I will never forget, and I suspect in some ways, will never truly get over. But as the days go by and my little girl becomes slightly less little, it is harder to begrudge it against myself. There are days, like today, when she hurls herself at me and head-butts my shoulders in eagerness for a cuddle and I think that maybe, it doesn’t matter. By hook or by crook, our children are born and it is what happens next that matters. And I fully intend to make our next as brilliant as I can. Wow Amy,I had no idea you had such a surprise.nicu hard enough when you know you are pregnant. you had a lot to take in so quickly. you and wriggles are doing so well,she is a lucky girl to have you. Lovely post. What an incredible start to motherhood! My goodness, what an incredible story, thank you for sharing. Oh my word!!!!!!!!!! I had NO idea that your NICU journey started in this manner. So shocking, that must have been so scary. Wow, just amazed by that. Very glad you started blogging. Did you know that you can shorten your urls with Shortest and get cash from every visit to your shortened urls.